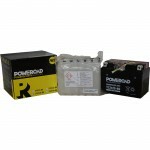 These batteries are delivered with the electrolyte in plastic sealed containers. They require activation before the first use. In order to activate the battery the content of the plastic containers should be poured into the battery. Please follow the instructions included in the box. Upon request, our team can activate the battery for you before delivery. Baterie moto 12v-9Ah,YUCELL YB9L-BS,YUASA YB9L-BS,fara intretinere, Borna + in dreapta. Curent de pornire 90A. Baterie moto fara intretinere 12V 7.5Ah 120A, Yucell YT9B-BS. Pentru motorete, scutere, motociclete, jet-ski, snow-mobile. Necesita activare. Baterie moto 12v-10Ah,YUCELL YT12B-BS,YUASA YT12B-BS,fara intretinere, Borna + in stanga. Curent de pornire 165A. Baterie moto 12v-12Ah,YUCELL YTX14-BS,YUASA YTX14-BS,fara intretinere, Borna + in stanga. Curent de pornire 270A. Baterie moto 12v-12Ah,YUCELL YTX14L-BS,YUASA YTX14L-BS,fara intretinere, Borna + in dreapta. Curent de pornire 270A.